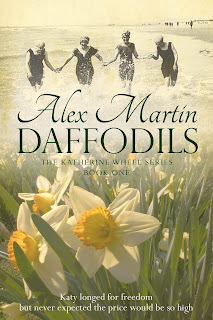 Alex Martin - In The Plotting Shed: Daffodils as an audiobook - coming soon! I'm busy narrating Daffodils into an audio book at the moment. Hard work it is too! The worst of it being cringing to the sound of my own voice. As I wrote Daffodils so many years ago, it's also made me take the big bad red editing pen to it! But it's a wonderful opportunity and I'm really enjoying the experience. A mic and a very sympathetic sound engineer aren't nearly as intimidating as a live audience, I've discovered. It's come about as a result of my interview with the delightful Leanna Broom on Oystermouth Radio. Grant Eden, the engineer at the radio station, is the most patient and generous person. He is helping me download the book on to an audio version and I'm indebted to him for his kind expertise. It takes a surprisingly long time to dictate a whole book and the sound editing seems to need an equal amount of time. Watch this space for Daffodils to be uploaded onto Amazon, Audible and iTunes. Meanwhile, Daffodils is still free as an ebook! Ah thank you Judith. Very weird hearing your own voice!